Is it works with WordPress 2.7 ? I am working on the 2.7 compatable version of the plugin – it will be ready “soon”. I tried the quiz but how do you upload a photo? I am using 2.8 and it is not working. Does this plugin take images? 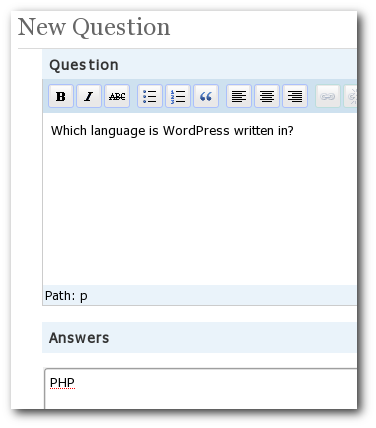 You can add an image into the question part easily – it uses the standard editor. To add a image into the answer field, you have to know HTML. But its possible. ok, cool! I’ll be waiting. Hi. I wonder if you have plans to extend the plugin in the future, to provide individual question feedback, add different question types, and allow users to compare their answers against the correct answers. This is very good as far as it goes, and it would be great if it went further. An area where few have ventured so far. I’m trying out the latest version. But still its not working on my 2.7. When I try to save a quiz after giving description, it throws a 500 error. This worked so much better than expected. I love the fact that you can give an explanation about the correct answers. I also like that it marks which questions were answered correctly and which ones were marked incorrectly. I found that to make it look right, I needed to add a little bit of space in front of each possible answer. Thanks for doing such a great job on this plugin. I took the quiz, this is exactly what I was looking for, thanks!! It works great, and was just what I was looking for, thank you so much! with proper respect & screenshots of your website’s home page…coz it would not have been possible without your plugin.Trust me…thanx in advance…may GOD BLESS YOU!! I checked your plugin on old WP versions its working awesome and must tell you it is something that can be called as cool..
1.How to create a merit list of let say top 10 players. 3.Is it possible to create a login type of page per user who is going to take the quiz. which will be used by the server to identify the winner. 4.wont there be a problem when simultaneously let say 10 people are opening the quiz page on their browser n taking up the quiz.will quiz work fine for everybody? 5. Am planning to set few systems as severs & installing wordpress locally in them & will be serving the quiz page from that server to every terminal. Plz reply soon buddy, now our team depending on you! if you do this you will help 1000 of us,reply soon. & also mail me ur gtalk id. This is not possible in the current version of Quizzin – if you are comfortable with PHP, you can modify the code to get this functionality. I am trying to configure this plugin but am having some small problems. I have enabled the Admin over SSL function in the wp-config.php and the Quizzin plugin does not seem to work. I am able to enable the plugin, and then open the “create quiz” page but when I click the create quiz button it sends me to the login page. The browser is switching from HTTPS to HTTP so I suspect that there might be an absolute reference in the code. I will try to have a poke around, but since you are most familiar I am hoping that you can go “oh yeah, I know where that is”. Thanks for your great plug-in, I am keen to get this working! I found some information at http://mu.wordpress.org/forums/topic.php?id=10130. The problem is caused by the use of “get_option(‘siteurl’)” in wp_frame.php. I want to translate to Turkish this plugin. Can you put in this page or e-mail me default.po file for Quizzin? I’ll send it to you via email. Thanks for your offer. I’ve translated your plugin localization file. But it wasn’t worked. Because, your quizzin.php file isn’t usable for local strings. 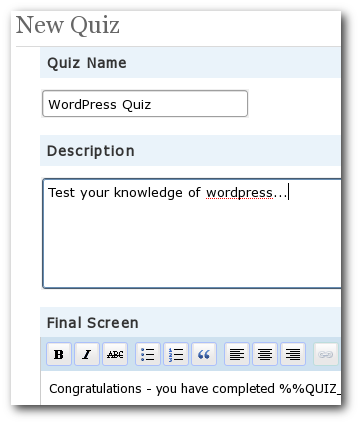 In this case, i’ve added to top lines of your quizzin.php load_plugin_textdomain('quizzin', "/wp-content/plugins/quizzin/"); .And it worked. Although, I’ve added Quizzin Settings page lines to (on blog’s admin page) your po file. And, I’ve edited questions apperance in quiz page on blog. It’s bold now. Everything tested and everything OK. now. I’m sending edited plugin files with English/Turkish .po and .mo files to you. Thank you for your plugin. Greetings from Turkey. Just installed in wpmu 2.7, and mostly works, except the final summary which is supposed to show the correct answers, your answers differently does not. I just see all the answers with an arrow icon next to each, and no background color difference. Also, even with 1 question, the Next button appears, but does nothing, of course. Just take the backup of the database. I have been trying out your quiz plugin and it is just great. Simple to use and easy to implement. Thank you. I was curious if there were a way email the quiz results to one or more people. Would you consider adding this functionality? I will start looking through the code but I am not an expert with php. If you could point me in the right direction it would be wonderful. I tried to install it on my blog but when I try to access quiz.php under wp-admin directory, I am getting following error. Did anyone fixed this problem? It is good to have more elaborate installation document. Nice work, is there any similar plug-in available for phpbb3? 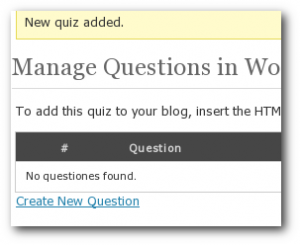 I was looking for a quizz plugin to install on my wp blog and just found out your plugin which is great ! Just one suggestion if i may, would be to make sure to reset the answers once someone has submitted them to get the score; otherwise through several itireration anyone can get to the max. score. thanks for this nice plugin. I had to translate it in German. Do you want to have the German-Files? I would love that – thank you. Any tips on getting a quiz to print out with the X’s and Check’s? 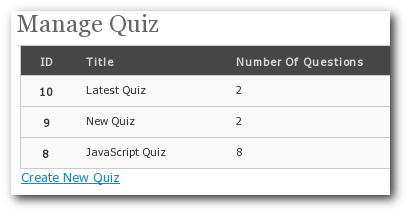 Quizzin Version 1.01.3 is the ONLY thing that breaks VALIDATION on my website. Anyone have a FIX? The element named above was found in a context where it is not allowed. This could mean that you have incorrectly nested elements — such as a “style” element in the “body” section instead of inside “head” — or two elements that overlap (which is not allowed). One common cause for this error is the use of XHTML syntax in HTML documents. Due to HTML’s rules of implicitly closed elements, this error can create cascading effects. For instance, using XHTML’s “self-closing” tags for “meta” and “link” in the “head” section of a HTML document may cause the parser to infer the end of the “head” section and the beginning of the “body” section (where “link” and “meta” are not allowed; hence the reported error). The mentioned element is not allowed to appear in the context in which you’ve placed it; the other mentioned elements are the only ones that are both allowed there and can contain the element mentioned. This might mean that you need a containing element, or possibly that you’ve forgotten to close a previous element. ” or “”) inside an inline element (such as “”, “”, or “”). Same error as others – “The plugin does not have a valid header.” Thoughts? OK, so I worked out the problem. It’s not with the plug-in at all. It seems like the automatic installer in the current version of WordPress is playing up a little. Just install the plugin manually and it works fine. “You do not have sufficient permissions to access this page.” even though I am logged in as admin. I’ve also found that a simple manual install fixes any problems I was having. I’m getting the same error after a manual install. I really want the plugin dislplay random quiz when refreshing the page. Could you add this ability ? TechBlog » Blog Archive » Let’s Quiz!